Like practically everybody nowadays, you probably already have a FaceBook account. And if you have some type of online business, you may have already given thought to using FaceBook to help drum up some business and connect with peers and potential customers. But one thing you may not have considered is setting up friend lists. Friend lists are one of the most helpful FaceBook features, and they allow you to categorize your friends for easy organization and to make managing access easier. A common usage is for grouping your contacts into different categories, so you can limit certain people’s access to specific sections of your FaceBook pages. And this is one particular feature that can be of tremendous value with regard to your social media marketing efforts. Now you may be thinking that you can achieve pretty much the same goals simply by creating different FaceBook profiles. It sounds good in theory, but this solution actually has a number of significant drawbacks. For one thing, FaceBook explicitly states that setting up multiple profiles is not allowed, and doing so may result in your FaceBook account being disabled. Even if FaceBook did allow you to set up different profiles, you would still have to deal with the difficulty of managing all those different accounts and organizing your contacts in each one. A far better solution would then be to stick to a single account and set up your friend list for better organization and efficiency. This presents a number of benefits in terms of social media marketing, among them allowing only certain people to your news feed and status updates, and to limit the people who see you in the FaceBook chat. 1. Click on the “Account” item on the top right of the main FaceBook page. 2. Click on the “Edit Friends” option. 3. Select the “Create A List” option. 5. Add friends to the list. Now you can set up as many lists as you like. You can set up a list according to location for example, or you can set up a list for regular customers, suppliers, and so on. Now here is where it gets interesting. 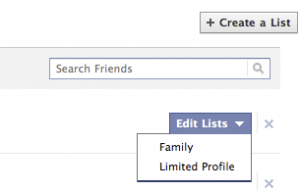 From your FaceBook Home page, you can filter out news feeds from all people in certain lists. By clicking on the arrow next to the “Most Recent” tab, you can specify which feeds from which lists appear on your wall. Conversely, you can also specify which list gets to see your status updates. Click on the blue arrow beside the “Share” button and click the “customize” option, and you will be able to block certain lists from seeing your updates. Finally, you will also be able to perform the same filtering functions in FaceBook chat. As you can imagine, this feature can have numerous benefits for helping you manage your contacts more effectively. If you are interested in utilizing FaceBook as a social media marketing tool, making use of the Friend list feature is absolutely essential. Facebook has received a large amount of feedback about their pages and how accessible and full of features they are. Facebook’s response was simple enough giving an upgrade to the pages and providing some newer features which are beneficial to users of pages. One of the major changes is the ability for page administrators to take control of their Facebook pages and log into them. This allows the administrators to respond as if they were the page instead of having to control it with their personal account. They can also engage in a variety of different activities within Facebook while using the pages as well. The changes to the Facebook pages will allow users to separate their personal Profiles from their professional ones through the use of a page. Users who wanted to have separate profiles for their professional and personal lives had to resort to creating two accounts which is actually against the terms of service for the site. Facebook pages also allow the use of the same picture bar that has been implemented in late 2010 for Facebook Profiles. The picture bar shows the 5 most recent photos that have been added by users to the page wall. Administrators have the ability to post images to the photo bar – however users do not, directly anyways. If an administrator tags a photo for the Facebook Page, it will show up in the bar, however if not the photo will just show up in the feed. Page administrators will also be able to like other pages as well and create a custom news feed which can be shown on the page to all of the administrators. The ability to promote the “staff” of the page is also implemented allowing for staffers to be associated with the page if they want to. All administrators also have the ability to subscribe to email notifications from the page as well as having an increased ability to track user engagement with notifications. Fans of the pages will be able to increase their exposure as well. This is possible through the default page wall to show everyone’s posts. Alongside this development, other pages that are liked by the main page will also be promoted for greater exposure under a “likes” category listing with cycling pages (if the page has several liked pages). All users benefit from the changes made to the pages in the upgrade.